I am so bad at updating in a timely manner. 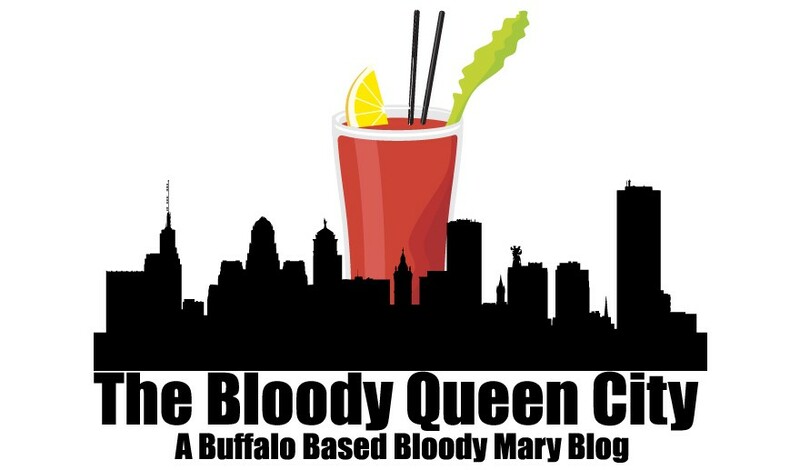 My deepest apologies for all of you many readers who have been waiting for more bloodies. For all those who have been waiting with baited breath, here you go. Chill 443 is a new restaurant that opened inside the Wyndham Garden hotel in Niagara Falls, NY. The building recently went through a renovation to turn the icky Days Inn with a Denny’s downstairs into the fancy Wyndham with Chill 443 for your drinking and dining pleasure. We started going late in the summer as they started hosting Trivia With A Twist pub trivia nights. They are a new company out of Ohio who just expanded their trivia services into WNY. I must toot my/our own horn here and admit that we take first place quite often. Often, as in, every time we’ve gone. So we keep winning gift certificates, and keep going back. Plus the food is decent, the beer selection is good, and they give a discount to locals. Our last visit I noticed they had a fully stocked selection of Bloody Mary garnishes, so I asked our friendly bartender Richard Phil (he looks like a Richard!) to make me up a drink. To change up our usual day off activities, J and I decided to play tourist and cross over to Niagara Falls, Canada for the evening. He was in charge of finding us a place to eat, and The Syndicate Restaurant and Brewery caught his attention, purely because of the name. Honestly, it is a pretty cool name. While we were driving I also asked my parents for the name of the brewery they had gone to and enjoyed, and what do you know, it was The Syndicate! There was no question where we were going to go now. Located a bit beyond the normal “touristy” areas of Niagara Falls, on Lundy’s Lane, it’s a small restaurant with the brew tanks in back and a small patio up front (if you like to watch traffic go by). They had an interesting lunch menu, with a few sandwich type options for dinner, and a price fixed dinner menu that included salad, fancier main dish, and dessert. 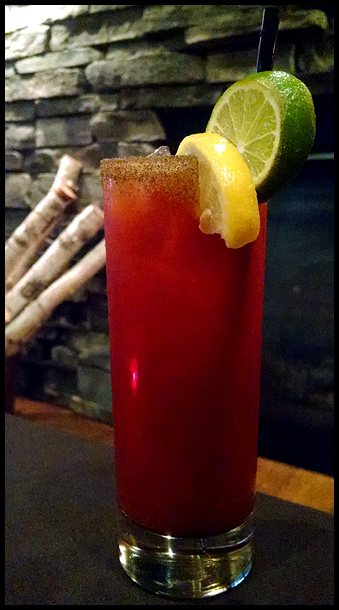 A beer and cocktail menu had some good options, including a sriracha Caesar…. I can’t say I enjoy seafood. I have an occasional shrimp when it’s in another dish, like Singapore noodles, but I’d never order it as a main dish. I don’t eat fish or shell fish. So the prospect of getting a cocktail with clam juice was horrifying. I debated it for a while, but in the end, I went for it. Garnished with a lemon and lime, and a spiced rim that was probably Old Bay seasoning, I was hesitant to take the first sip. I couldn’t wait forever though…and…it was good!! It was spicy and garlicky and pretty tasty. There was just the hint of something else from the clam, umami or whatnot. I was scared of there being a very strong fishy taste, but there really wasn’t. None of the flavors were overwhelming, but it wasn’t boring. I’m still not sure I understand Clamato juice, and I don’t think I’ll be drinking it with a beer any time soon, but I don’t need to be scared of Caesars anymore! This is my first Bloody Mary served in a Hurricane Glass! For $6.50 (Canadian) I was surprised at how cheap it was. Drinks on the casino floor (not free in Canada, and also crappy) push $10, so I figured it would be the same at the fancy secret bar, but nope! 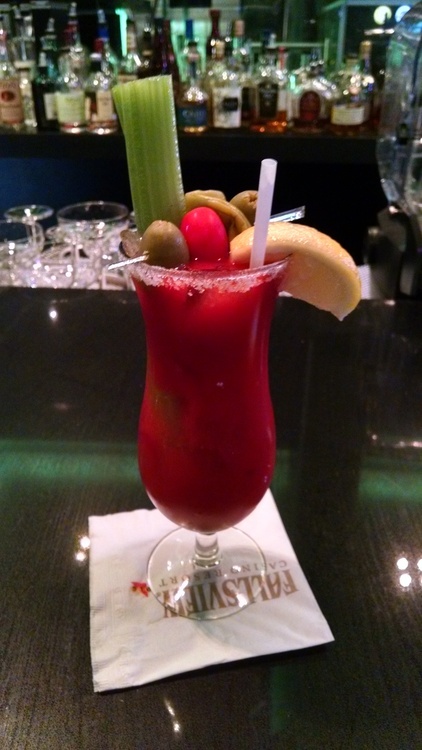 Garnished with celery, lemon, 2 olives, a cherry tomato and peperoncini, I was impressed. Add the salted rim for a nice touch. Nice spice level, but it was probably straight tomato juice with added Worcestershire and Tabasco. Their menu did offer options on flavors, with different kinds of Tabasco, like Chipotle but the bartender didn’t ask my preference (perhaps because I just asked for super spicy). It was good, just fairly standard. They get points for the garnish though. I am currently on my way to St Louis to visit my aunt, to watch the Sabres lose some more and to taste some Bloodys! 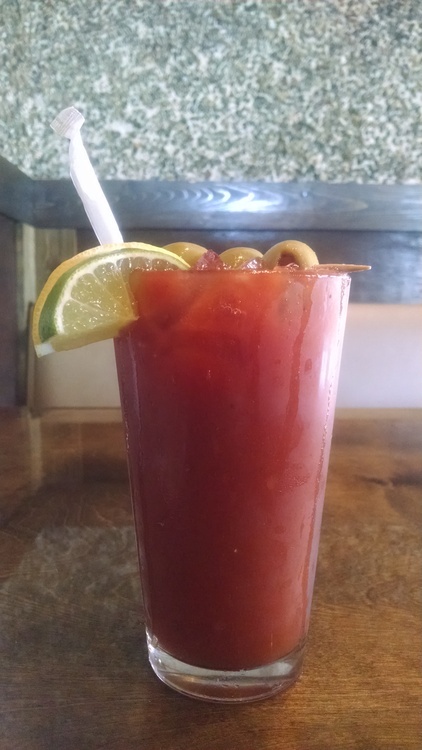 I googled some “best Bloodys” for St Louis and found a few potential locations. We’ll see! Niagara Falls, NY is a bit of a tragic city. We have this amazing natural wonder of the world, but the area immediately around it is lacking in attractions other than the casino. Go a few miles away and we have an outlet mall and shopping district that finally, FINALLY, after years has more than just Applebees, to eat at. We now have The Griffon Pub. The building used to be this fairly crummy diner that I would eat at from time to time with LeighAnne when we lived near by, and The Griffon totally remodeled it into a comfy gastropub. 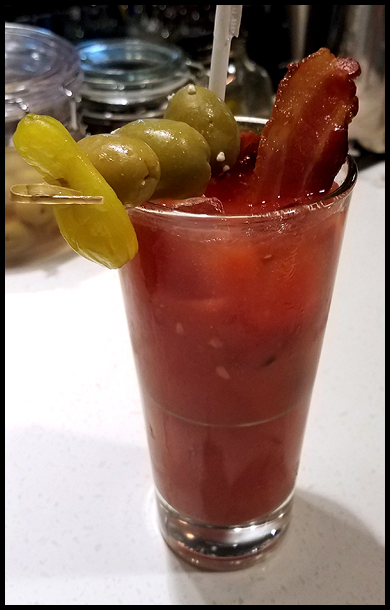 Since they are more of a pub than a cocktail bar, they have an extensive beer list, they do have a full bar, so I asked for a Bloody Mary to see how they’d do. Served in a pint glass for $6, this Bloody was garnished with 3 olives, a lemon and a lime. It was very spicy despite no visible pepper or horseradish, and no Frank’s Hot Sauce flavor either. It was more citrus-y than you normally get, and pretty decent. Given that The Griffon isn’t a cocktail bar, maybe they just have a really good pre-mix. The Griffon’s menu is fantastic. We went back to back days because we were in the area, and have gone back at least one other time since. There are just so many things we want to order. This time I had the Chicken and Waffle sandwich – holy crap, it was delicious. I had another one at a different gastropub a week later, and it didn’t hold a candle to the one from The Griffon. The staff has been super friendly each visit, and they have always been busy (last visit we had to eat at the bar). Finally something good in the Falls!